The Cleopatra Wig is a long blunt cut styled wig most often associated with a traditional Cleopatra. The wig features an elastic band for a comfortable and secure fit to almost any head size and is available in a wide range of colors. 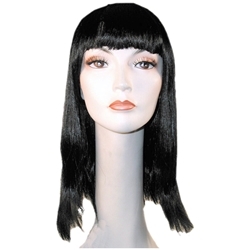 This wig is most popular in black for Cleopatra, but is available in a wide selection of colors that can be used for any number of characters or styled to make the wig unique to you. In brighter colors this wig works well for female clowns or Ariel's sisters in The Little Mermaid.